The fire broke out shortly after 0600 GMT at the Animal Adventure section before spreading to an adjacent gift shop and cafe, near an area where visitors can handle and feed animals, the zoo and London Fire Brigade said. 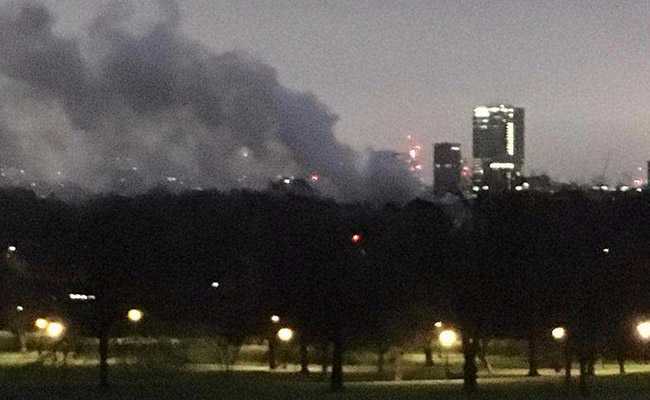 Smoke rises above London Zoo in this image obtained from social media. London: More than 70 firefighters tackled a blaze at London Zoo on Saturday and although no animals were immediately reported to have been injured, one aardvark was missing. Staff on duty moved animals to safety and the fire was brought under control about three hours later. "A number of zoo staff have been treated at the scene for smoke inhalation and shock," the zoo said in a statement. "Our staff are now in the process of assessing the situation in difficult conditions. At present one aardvark is currently unaccounted for." The zoo, located in Regent's Park in central London, said it would be remain closed until further notice. The attraction, the world's oldest scientific zoo which dates it origins back to 1826, houses 20,166 animals, according to its inventory for 2017. The fire brigade said it had sent 10 fire engines and 72 firefighters to the scene, adding the cause of the blaze was under investigation. "The fire mainly affected the cafe and shop," said Station Manager Clive Robinson. "Part of nearby animal petting area was also affected although at this stage we don't know if any animals were involved."